Mid century modern designed by renowned architect Hugh Newell Jacobsen. 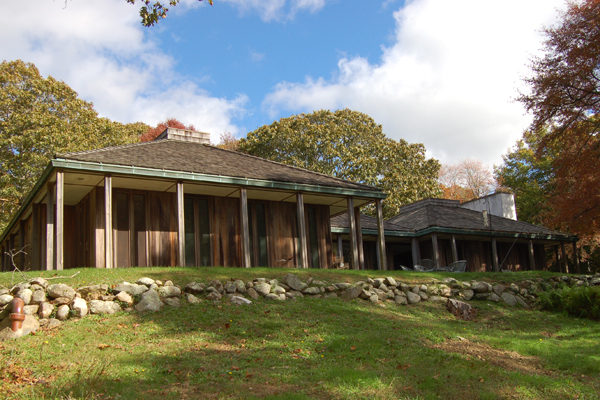 This home is set on 6.9 acres near the north shore of West Tisbury. Dramatic styling is seen in the living room with a vaulted, skylit ceiling lined in vertical strips of cypress. Walls of windows line the dining room and provide a frame for the view of lush landscaping and sloping terrain. This home features four bedrooms and three baths. Located in a private community dedicated to conservation of land and resources of Martha's Vineyard, this property is complete with access to miles of walking trails, a private north shore beach and tennis courts.